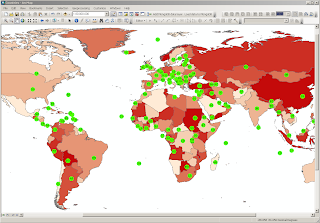 Data Scientists, if you are processing and analyzing spatial data and are using Python, then ArcPy should be included in your arsenal of tools and ArcMap should be utilized for geo spatial data visualization. Following the last post where I extended Apache Hive with spatial User Defined Functions (UDFs), in this post I will demonstrate the usage of the "extended" Hive within Python and how to save the output into a feature class for rendering within ArcMap or any ArcWeb client using ArcGIS Server. When ArcGIS for Desktop is installed on a host, Python is optionally installed and is enabled with GeoProcessing capabilities. Install Hive on your desktop and set the environment variable HIVE_HOME to the location where Hive is residing. To access the Hive python libraries, export the environment variable PYTHONPATH with its value set to $HIVE_HOME/lib/py. With the setup behind us, let's tackle a simple use case; Given a polygon feature class on the desktop and a set of points stored in the Hadoop File System and are exposed through a Hive table, I want to perform a point in polygon operation on Hadoop and update the local feature class polygon attributes with the return results. The script imports the Thrift Hive client and the ArcPy library. It then connects to the Thrift Hive server on the localhost and executes a set of setup operations. The first two add the countries shapefile geometry and spatial index files into the distributed cache. The next setup adds the jar file containing the spatial UDF functions. The last setup defines the pip function with a reference to the class in the loaded jar. The select statement is executed to retrieve the country identifier and the number of cities in that country based on a nest select who uses the pip function to identify which city point falls into which country polygon. An fid with a value of -1 is returned if a pip result is not found and is excluded from the final group count. The fetchAll function returns a list of text items, where each text item is an fid value followed by a tab then a count value. A dictionary is populated by tokenizing the list where the dictionary key is the fid and the value is the count. An arcpy update cursor is opened on the local countries feature class and a row iterator is executed. for each row, the FID value is retrieved and checked if it exists as a dictionary key. If found, the attribute HADOOP field is updated with the dictionary value. Upon a successful execution (and remember, this might take a while as Hive is a batch process), open ArcMap, load that feature class and symbolize it with a class break qualifier based on the HADOOP field values. Pretty cool, no? This is a very very simple example of the marriage of a BigData tool and a GIS tool using Python. There is so much more that can be done using this combination of tools in the same thought process. Expect more posts along the same vein with more arcpy usage. I just wanted to plant a small seed in your mind. Following the last post, where we used Pig to analyze data stored in HDFS, in this post we will be using Hive and spatially enabling it for geo analysis. Hive enable you to write SQL like statements in a language called HiveQL that Hive converts to a MapReduce job that is submitted to Hadoop for execution. Again, if you know SQL, then learning HiveQL is very easy and intuitive. Hive is not intended for OLTP and real-time analysis. Like Pig, Hive is extensible via User Defined Functions (UDFs), so we will be using almost the same functions as in the previous post to find things that are near and/or within some criteria. There are several ways to store data in HDFS, one of them is in the SequenceFile format. This is a key/value binary format with compression capabilities. For this post, I will be transforming an input into a well know binary format to be stored onto HDFS for later query and analysis. The input source that I wanted to test in my ETL is a set of cities (cities1000) in TSV format downloaded from geonames. The Writable object to read and write from a SequenceFile is a City class that extends a Feature and is augmented with attributes. Next, I wrote and executed a Java program using the opencsv library to extract, transform and load the TSV into SequenceFile records onto HDFS. If you know SQL, this should be familiar. But note the last two lines; It instructs Hive to read the data in a SequenceFile format from an HDFS location that we previously prepared and since the data is in a binary format, each row is serialized and deserialized using a helper SerDe class. The UDFNear function extends the UDF class and implements in this case the Haversine distance calculation between two geographical locations. Let's assume that the field 'country' was not defined in the table, and I want to find the count of cities per country where I only have the spatial boundaries of the countries. This is a perfect spatial join and where UDF, DistributedCache, and spatial libraries like JTS and geotools come to the rescue. The first two lines load into the distributed cache the countries borders shape file and its spatial index - these will be used by the pip function first time through to create an in-memory spatial index for fast searching. The pip function is defined as a class in the previously added jar file. The pip function expects 3 arguments; the first is a longitude, the second is a latitude and the third is the shape file location in the distributed cache. Based on these arguments, it will return the country border record identifier where the longitude and latitude arguments fall into or a -1 if there is no intersection. For the query, a nested table is first created based on the pip result, which is then grouped and aggregated based on a non-negative border identifier. The fun is not about to stop. Since this is SQL-Like, Hive comes with a JDBC driver. Using my favorite Java framework, Spring-Hadoop integrates with Hive to become a JDBC client. A Hive data source bean is defined using the Apache commons database connection pool library. The data source driver class property is set to the Hive JDBC driver and a set of SQL statements are executed upon start up. These statements add the jar containing the UDF classes to the distributed cache and declares a reference to the 'near' and 'dist' UDFs. Finally, a JDBC Spring template is defined with a reference to the aforementioned data source. This template will be injected into a service bean to enable SQL query execution and row mapping. The see physically the result of the query on a world map, the Flex API for ArcGIS Server is utilized. Bridging the server side and the client side is the Spring Flex Integration project. This enables a Flex client application to execute functions on Spring based Remote Objects. I've talked extensively in my previous posts about the beauty of the no-impedance mismatch between the server side and client side transfer objects such as in the case of FeatureSet, MapPoint and Feature instances. This HiveService is injected with the Spring defined JDBC template and exposes a 'query' function that expects a 'where' clause string. Upon a successful execution, each result set is transformed into a Feature instance that is appended to a list who this transferred back to the client in a FeatureSet instance. Onto the client. This is a simple Flex implementation where the map and a data grid are stacked on top of each other. A user can enter a where clause that is sent to the server 'query' function using the RemoteObject capabilities. Upon success execution, a FeatureSet is retuned and the features are rendered on the map in a GraphicLayer instance and the same features are rendered in a DataGrid instance as data rows. A user can click on a row in the data grid to highlight the feature on the map. Vice versa, a user can click on a feature on the map to highlight a row in the data grid. I know that this is a lot of information. Thanks for reading it through. Like usual you can find all the source code from here.